Tripoli says the arrest warrant for Muammar Gaddafi issued by the International Criminal Court (ICC) is just a cover for continued NATO bombings, while the court itself has no authority over Libya. "This court is nothing but a cover for the military operations of NATO. 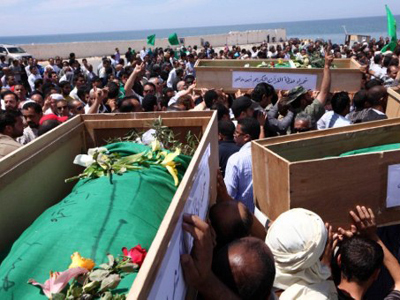 NATO that tried time and again and declared it frankly that it would assassinate the brother leader and his family. These actions of NATO are themselves crimes against humanity, crimes that the ICC should tackle and deal with," Mohamed al Qamudi, Libya’s justice minister, said at a news conference. Russia, which recently sent its peace envoy Mikhail Margelov to Libya, says that it is unclear what impact the court’s actions will have on peace-making efforts in Libya. 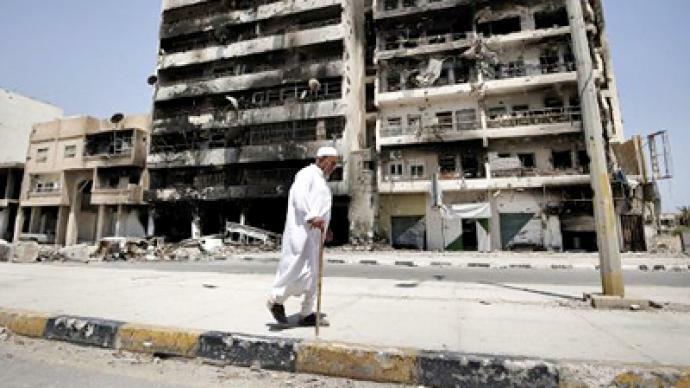 “The international commission which visited Libya found that war crimes were committed by government forces as well as some of the opposition fighters. We hope that the investigation will be fair, non-politicized and lawful. On the political side of the matter – I hope this warrant won't negatively affect the efforts to bring a peaceful solution to this conflict,” Russia’s Foreign Minister Sergey Lavrov said in Moscow. Meanwhile RT investigated the consequences of the continuing airstrikes, which are said to be directed only at military targets. The road from the Libyan capital Tripoli to the town of Brega is lined with the aftermath of war. Towns abandoned as the population fled the bombardment. Debris and damaged metal construction is what is left of the civilian airport in the city of Ras Lanuf, home to one of the country’s key oil refineries. The last plane took off from the runway just hours before it was destroyed. While NATO insists it is only hitting targets of military value, locals say the telecommunication tower some 15 kilometers from Brega has been damaged by a NATO air strike. Now it lies broken on the ground. The eyewitnesses told RT the bombing also accidentally burned two cars and killed two people. Since then there has been no TV in this area, and mobile phone services have also been disrupted. There is no water and no electricity. What used to be heaven, local resident Ahmed Massoud says, has become hell. What was home now feels unfamiliar. “I have nine children and I sent them all to my relatives abroad. I don’t want them to see their motherland like this,” he said. From a small port not far from Brega, Libyan oil used to flow to Europe. “We used to produce fuel to send it to them. And now see – they destroy it all. This is terrible and ridiculous at the same time!” an outraged local resident told RT. The closer you get to the frontline, the more you feel it. You can hear the war. And you can even read it – on the leaflets NATO drops, just before the bombers arrive. One says in Arabic, that NATO is in Libya to enforce a non-fly zone over the country. On the other side there is another sign in Arabic saying NATO can strike any place in Libya and at any time. This “any time” happened three times over several hours while RT’s crew was filming. Brega, Libya’s major oil port is where the frontline lies, dividing the country into two parts – into two sworn sides. 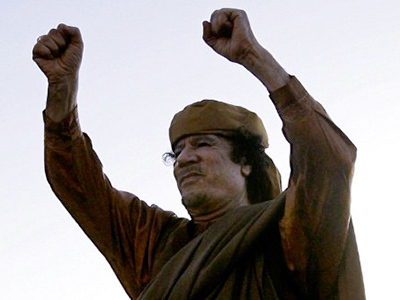 It has been a frequent flashpoint between the rebels and Gaddafi’s forces. It is a strategic location: getting a firm handle on this town would mean taking control over the country’s economy. Oil facilities seem to be a target that NATO bombs never land on. While it looks like the civilian population can hardly escape. Another ruin used to be a restaurant for oil company staff where friends gathered after work. From one street to another the stories are repeated. Abdel Ghani, an employee of the Sirte oil company, spoke to RT in English. 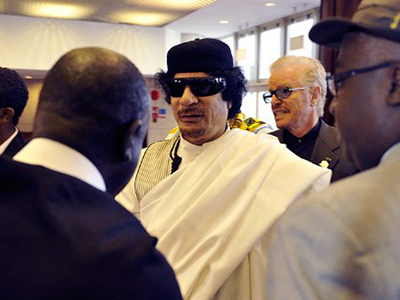 He says Libyans want to be left alone and decide on how to live, without foreign intervention. “We can solve our problems alone. We don’t need any interference. Why is NATO every day bombing and killing our civilians. Let NATO go away from this country! This is Libya!” he said. While such voices become more and more frequent, it is the sound of exploding bombs and war planes that drowns them out. ­The only way to resolve the Libyan crisis is for Gaddafi to leave power, believes Joel Rubin, a peace activist from the Ploughshares Fund. The ICC warrant now complicates this: Gaddafi now cannot leave the post safely, as he knows that The Hague will want to get him arrested and tried. The peace activist stresses that the International Criminal Court has taken action on the grounds of evidence; otherwise they would have issued a warrant to arrest Muammar Gaddafi years ago. “They see the massive population displacement, the refugees, the deaths and injuries. If Gaddafi leaves, then this will stop. They have identified the person as the perpetrator, so they are going forward,” concludes Rubin. ­Mohamed Hassan, former Ethiopian diplomat and Middle East expert, who has been in Libya on a fact-finding mission into the war, says the majority of Libyans see NATO's intervention as an attempt to divide the country.